On February 8, 1974, astronauts Gerald P. Carr, Edward G. Gibson, and William R. Pogue, after an eighty-four-day mission in outer space aboard an orbital laboratory named Skylab, boarded an Apollo command module and returned to earth. Their splashdown marked the end of a venture involving three separate crews that had set twenty-five International Aeronautical Federation world records and had managed to complete ninety major scientific experiments.1 It therefore surprised no one when two months later the Collier Committee announced that it had selected the Skylab program as the recipient of the 1973 Robert J. Collier Trophy. The official announcement of the award duly noted the importance of "the production of data of benefit to all the people on Earth," but had prefaced that praise by asserting that Skylab had proved "beyond question the value of man in future explorations of space. "2 The Skylab program, then, had a great immediate impact in aiding the expansion of scientific knowledge, but also offered the long-range benefit of demonstrating the importance of the continuance of the human component in the American space program. 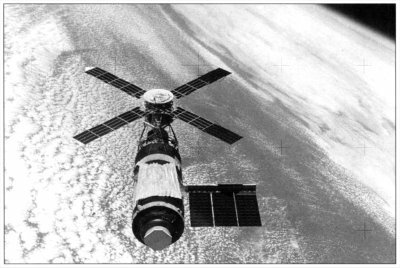 This essay examines the history of Skylab. The story begins with the first suggestions for a laboratory in outer space, then turns to a discussion of how such an idea gained official acceptance from the National Aeronautics and Space Administration (NASA). Each of the missions will be considered, and the results they yielded will be assessed. Throughout the story, I will analyze how various groups competed with each other to control the design, timing, and function of the project. Although stressing the role technological innovation played in the eventual success of the Skylab program, I will demonstrate how the human element was crucial at every stage of this "exceedingly complex enterprise. "3 Finally, I will suggest the ways in which the program resonated with, and still influences, the goals and objectives of NASA. 1. W. David Compton and Charles D. Benson, Living and Working in Space: A History of Skylab (Washington, DC: NASA SP-4208, 1983), pp. 379-386. 2. Astronautics and Aeronautics, 1974 (Washington, DC: NASA SP-4019, 1975), p. 95. 4. John M. Logsdon, "Space Stations: A Historical Perspective," in Mireille Gerard and Pamela W. Edwards, eds., Space Station: Policy Planning and Utilization (New York, NY. IEEE, 1983), p. 14. The Skylab space station cluster in orbit. Note the solar shield, deployed by the second crew, which shades the Orbital Workshop. The OWS solar panel on the left side was lost on launch day. NASAs Skylab program, with special recogwition to program director William C. Schneider and the Skylab astronauts, received the Collier Trophy in 1973, for the production of scientific data about long-term spaceflight. (NASA photo no. 74-H 98). The prospects for an orbiting Space Station improved remarkably with the success of the German V-2 rocket program during the second World War. In the postwar years, the United States Army combined German technology with work done during the war by the jet Propulsion Laboratory to create successively more powerful rockets. Aware of the progress in this area, individuals from a number of countries soon made detailed proposals to take advantage of the launch capabilities rockets now offered. But in spite of the fact that launch vehicles by the mid-1950s had demonstrated great potential for lifting payloads into outer space, no government proved willing to commit itself to backing a venture to place an object into Earth orbit. A manned orbital laboratory therefore remained a distant goal. But official interest in the concept of a Space Station soon came in the wake of the launching of Sputnik I in October 1957. To develop and guide a systematic American response to the Soviet accomplishment, in 1958 Congress passed a law which created a civilian space agency, the National Aeronautics and Space Administration. Shortly after NASA became operational, T. Keith Glennan, the agency's first administrator, announced that the United States would launch a person into outer space as part of its program of operations.5 Encouraged by this development, certain individuals at NASA soon began to explore the possibility of placing a Space Station and operations crew into Earth orbit. 5. For a full treatment of Project Mercury, see Loyd S. Swenson, Jr., James M. Grimwood, and Charles C. Alexander, This New Ocean: A History of Project Mercury (Washington, DC: NASA SP-4201, 1966). This groundswell of interest soon found support from the higher echelons of the space agency. Appearing before the Senate Committee on Aeronautical and Space Sciences on February 20, 1959, NASA Deputy Administrator Hugh L. Dryden and Assistant to the Director of Space Flight Development DeMarquis Wyatt discussed the missions the agency eventually hoped to accomplish; a Space Station and an orbital manned laboratory figured prominently in their plans.6 Indeed, NASA would request two million dollars for fiscal year 1960 to conduct a feasibility study regarding the building of a space laboratory. By the spring of 1959, NASA had definitely embraced a concept which two years earlier had seemed quite remote. The minutes of this conference clearly indicate that by the end of 1959 NASA had taken significant steps toward creating a program to place a laboratory and crew in orbit. But the record also shows the agency recognized even at that early date that landing a person on the Moon might rank as a higher priority program in the American space program. Indeed, the participants at the July 10 meeting noted that they envisioned the space laboratory "as one of the initial steps in the actual landing of a man on the moon in 10-15 years. "9 This focus suggests that from the beginning the agency saw an orbital laboratory as merely a component of a larger mission, rather than as a program which could stand on its own technical merit. 6. U.S. Congress, Senate, NASA Authorization Subcommittee of the Committee on Aeronautical and Space Sciences, NASA Supplemental Authorization for Fiscal Year 1959; Hearings on S. 1096, 86th Congress, 1st Session, 1959, pp. 46, 8 1. 7. Roland W. Newkirk, Ivan D. Ertel, with Courtney G. Brooks, Skylab: A Chronology (Washington, DC: NASA SP-4011, 1977) p. 9. 8. Beverly Z. Henry, Jr., Aeronautical Research Engineer, Memorandum for Associate Director, October 5, 1959, Skylab, Box 06,, File Skylab/AAP Documentation 1959, NASA Historical Reference Collection, NASA History Office, NASA Headquarters, Washington, DC. 9. ibid. The Prediction of the participants about the earliest possible date for a lunar landing was remarkably prescient. Up until this point, all of the work done on projects to succeed Apollo had a classification of "advanced study programs." But these feasibility studies and reports, suggesting the potential benefits from such efforts, soon began to change the perspective of the space agency. Moreover, the realization that without concrete plans in the very near future much of the Apollo workforce would be idle for a significant period of time prodded the NASA hierarchy to consider immediate steps to provide continued work for them. Accordingly, in August 1965 NASA officials decided to change the status of the post-Apollo program to that of "project definition." As part of this process, one month later the agency changed the name of the project to the Saturn-Apollo Applications Program (AAP). 10. Ernst Stuhlinger and Frederick I. Ordway III, Wernher von Braun: Crusader for Space, (Malabar, FL: Krieger Pub. Co., 1994), pp. 172-79. 11. Compton and Benson, Living and Working in Space, p. 9. 12. U.S. Congress, House, Committee on Science and Astronautics, 1964 NASA Authorization: Hearings on H.R. 5466 (Superseded by H.R. 7500), 88th Congress, 1st Session, p. 20. 13. David S. Akins, Skylab: Illustrated Chronology, (Huntsville, At, MSFC, 1973), footnote, p. 105; Memorandum for the record, April 12, 1963, Box NASA, Administrator's Policy Meetings (1962-65), Folder Administrator's Policy Meetings—#2, Jan.-June 1963, NASA Historical Reference Collection Compton and Benson, Living and Working in Space, pp. 15-18. 14. Memorandum on NASA future plans, from George Mueller, Associate Administrator for Manned Space Flight, April 28, 1964, Box 06, Skylab, Folder Skylab/AAP Documentation 1964, NASA Historical Reference Collection. Mueller considered a number of possibilities, but soon chose an idea suggested jointly by the Douglas Aircraft Company and the Marshall Space Flight Center (MSFC). Ironically, it involved embracing the idea, first suggested by Wernher von Braun, of making a laboratory out of the final stage of a launch vehicle that had expended its fuel and had gone into orbit. A second launch vehicle would take a crew of astronauts into outer space to rendezvous with the spent stage; these individuals would then flush any residue out and put in the components of the laboratory. The concept, known as the "wet workshop," had technical merit, but also had an economical appeal as well. Mueller recognized that the rapid progress on the Apollo program meant that NASA would not need all the Saturn rockets it had originally ordered, therefore freeing him from the necessity of purchasing additional launch vehicles for the AAP. At a time when the financial demands of the Vietnam War had just started to compete with NASA's budgetary requests, such potential savings from AAP had great appeal to the agency. NASA Associate Administrator Robert C. Seamans gave Mueller his approval for the proposal in March 1966, and in November Mueller made a formal presentation to NASA Administrator James E. Webb.15 Official backing came when Congress, acting upon Webb's recommendation, appropriated approximately $450 million for the AAP in the 1968 Fiscal Year budget. 15. Memorandum from Robert C. Seamans, Jr., to Associate Administrator for Manned Space Flight, March 28, 1966, Box 09, Skylab, Folder S-IVB Workshop, NASA Historical Reference Collection; Compton and Benson, Living and Working in Space, p. 38. 16. Lee B. Summerlin, Classroom in Space (Washington, DC: NASA, 1977), pp. 11, 12. 17. Compton & Benson, Living and Working in Space, pp.69-76. Astronautics,while initially distressed by the loss of the Advanced Orbiting Solar Observatory, would find the data gathered by the three Skylab crews had given them "the best observations ever obtained from space." Ibid, p, 344. 18. Ibid, pp.76-79; George Mueller to Robert Gilruth, December 21, 1966, Box 09, Skylab, Folder S-IVB Workshop, NASA Historical Reference Collection. NASA could place a space laboratory into orbit by the middle of 1968. Understandably, then, George Mueller considered the time right to reveal his plans to the national media; at a press conference on January 26, 1967, he spoke publicly, for the first time, about the ambitious space laboratory program of the agency. But an event which occurred the very next day put the hopes of those involved with the project on hold, and came close to scuttling the idea entirely. Technicians at work on a piece of test hardware for the Apollo Telescope Mount for Skylab at the NASA Marshall Space Flight Center. Called an ATM spar assembly this piece of hardware was made for heat tests in a Marshall Center vacuum chamber: Replicas of the ATM solar experiments and other equipment were mounted on the spar and a metal outside covering added. 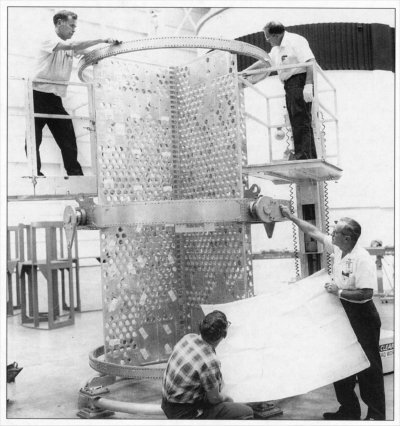 The ATM canister was tested in MSFC's Sunspot II vacuum chamber Working on the spar are, from the top left, Ronald Andrews and R.M. Freeman; J. B. Pendegraft, kneeling.- and J. R. Clift holding blueprint, all of the Manufacturing Engineering Laboratory. (NASA photo no. 69-H-1621). Unfortunately, the impact of the fatal fire did not end with the postponement. Congress, concerned about the efficacy of NASA programs and recognizing the increasing financial burden of the Vietnam War, appropriated only $300 million of the $457 million asked by NASA for the AAP in fiscal year 1968. This reduction forced officials in the AAP to further postpone the orbital laboratory schedule, which would involve three separate missions, back into the 1970 calendar year. At the conference, both sides presented their views on the wet workshop proposal. George Mueller felt that the proponents sufficiently answered the objections to the AAP plans for an orbital laboratory, and reported favorably on the concept to Robert Seamans. But the top echelon of NASA management still had reservations based on the concerns voiced during Seamans' summer tour, and therefore NASA Administrator James Webb felt compelled to call for a total AAP review, which he scheduled for December 6. At that meeting Webb found adequate reasons for placing the wet workshop proposal on hold until the agency could conduct a total review. 19. Compton and Benson, Living and Working in Space, pp. 83-84. 20. Newkirk, Ertel, with Brooks, Skylab, p. 123. 21. Compton and Benson, Living and Working in Space, pp. 96-97.
the Vietnam War, Great Society efforts, and the space program, would not appropriate funds for such a modification. Moreover, NASA Administrator Webb, who at one time had strongly supported AAP, had by this time become a lukewarm proponent at best. Discussing AAP at a meeting with directors of the space Centers, Webb asserted that the program was merely "a surge tank for Apollo." Convinced that no other space agency program should demand funds which NASA Could spend on Apollo, Webb authorized only those expenditures for the space laboratory regarded as absolutely necessary.22 Many wondered if NASA would launch the workshop in any configuration, much less agree to a dry workshop program. just as the prospects for AAP seemed to have reached the lowest point, however, a series of events transpired which revived the flagging program. First, NASA Administrator ,James Webb announced his retirement in the fall of 1968. His successor, Deputy Director Thomas O. Paine, had demonstrated a much firmer commitment to the concept of a manned space laboratory, and would become a valuable asset to the project. Second, NASA successfully flew a manned Apollo mission in October 1968, restoring public confidence in the space program in general. Finally, the memorable December 1968 flight of Apollo 8 seemed to have made Congress more amenable to NASA budgetary requests; by April 1969 NASA officials knew that they would have at least $252 million to spend on AAP. Thus reassured, they could plan for the space laboratory with confidence. With their hopes bolstered by the recent turn of events, NASA officials began to firm up plans for an orbital space laboratory. But as those involved in the project resumed their work, they noted a subtle change in the attitude of George Mueller. The man who had long championed the concept of a wet workshop now seemed determined to utilize the proposal of Floyd Thompson's committee as well. Indeed, at a conference on May 3 and 4, 1969, Mueller announced to those involved in the program his hope of developing a series of missions which would include both a wet and a dry workshop. Mueller's plan struck many as impractical. Some pointed out the financial burdens of redesigning AAP missions, while others noted how adding a second type of workshop would delay the program. But it occurred to Leland E. Belew, the director of the Marshall Space Flight Center's Saturn-AAP Office, that NASA could save time and money by merely replacing the plan for a wet workshop with one for a dry workshop. Mueller immediately saw the logic of this suggestion, and called upon those involved in AAP to voice their opinions. Gradually, a consensus emerged in favor of launching a prefabricated laboratory on a Saturn V rocket as the sole AAP effort involving a manned space workshop. Thomas Paine made the decision complete when he gave his formal approval on July 18, 1969. 22. Ibid, pp. 99-104; W. Henry Lambright, Powerng Apollo: James E. Webb of NASA (Baltimore, MD: Johns Hopkins University Press, 1995), pp. 193-196. While agreeing with Compton and Benson on Webb's attitude in 1968 towards AAP, Lambright disagrees with them about how Webb had felt about the program until that time. Compton and Benson assert that the NASA administrator "had never been an enthusiast for AAP," while Lambright maintains that Webb gave post-Apollo a high priority through at least 1966. For the respective arguments, see Compton and Benson, Living and Working in Space, p. 104, and Lambright, Powering Apollo, p. 139. 23. Lambright, Powering Apollo, pp. 195-96.
shortly. In fact, on July 22, 1969, those involved in AAP received the word to proceed with the dry workshop program .24 With the goal of the Apollo program successfully attained, NASA could devote more of its attention to planning for the future. An indication of this shift came in February 1970, when the agency chose a name for the dry workshop proposal. After considering over 100 possible suggestions, the NASA Project Designation Committee selected the title Skylab, submitted by U.S. Air Force Lieutenant Colonel Donald Steelman. But it soon turned out that not everyone shared the optimism of the agency regarding the future of the American space program. Thomas Paine had hoped to use the success of the Apollo program as a springboard for funding more ambitious projects; much to his frustration, however, he found in September 1970 that the Nixon Administration hoped to cut the NASA budget substantially. On the fifteenth of that month, Paine resigned. His acting replacement, George M. Low, tried to salvage as much funding as possible from the Nixon Administration. He succeeded in minimizing the cuts to the Skylab project, but Low knew that this would still necessitate a readjustment of that program's schedule. The Office of Manned Space Flight finally set the date for the first launch of Skylab for April 1973, and work on the program began in earnest. By this time, the Skylab program had lost one champion, but had gained another. George Mueller, the person who had guided the idea of an orbital laboratory through troubled times, had resigned from NASA in 1969. While he would be missed, William C. Schneider, who had become the director of the AAP in December 1968, had already demonstrated the same enthusiasm for the orbital workshop concept that Mueller had exhibited. Building on the foundation established by Mueller, Schneider worked steadily on ways to expedite the progress being made on the project. The former Apollo mission director found the NASA system of reviews, implemented during the Apollo program, of great help in keeping the program on schedule. 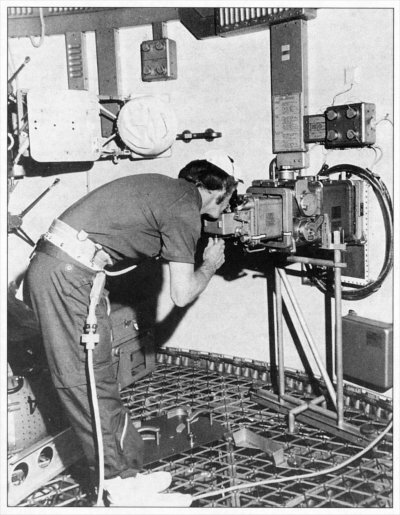 The procedure, which involved formal assessments at seven different stages of development, insured that program officials could quickly identify potential difficulties.26 By the end of 1970, Schneider had approved the last of the modifications necessitated by the change to the dry workshop configuration, and had authorized the testing of the components for the project. 24. Newkirk, Ertel, with Brooks, Skylab, p. 169. 25. Leland F. Belew, ed., Skylab, Our First Space Station (Washington, DC: NASA, 1977), pp. 16-34. 26. Compton and Benson, Living and Working in Space, pp. 118-23. For a discussion of the Apollo system of management see Robert C. Seamans, Jr., and Frederick I. Ordway, III, "Lessons of Apollo For Large-Scale Technology," in Frederick C. Durant III, ed., Between Sputnik and the Shuttle: New Perspectives on American Astronautics (San Diego, CA: Univelt, Inc., 1981), pp. 241-87.
elaborate system for storing and preparing meals than the Marshall Space Flight Center felt the laboratory could accommodate. In the end both sides compromised, and Schneider faced no further controversy involving the habitability of Skylab. One month later, NASA received the other major component of the Skylab vessel. Technicians at the space agency had designed a docking facility and airlock for inclusion in the project; these would allow a crew in an Apollo command module to rendezvous with Skylab in outer space and enter the orbital laboratory. In the summer of 1970, the Martin Marietta Company had built a multiple docking adapter and had sent in to the St. Louis facility of McDonnell Douglas where workers would connect it with the airlock they had constructed. On October 5, 1972, a NASA Super Guppy airplane flew this last component to the Kennedy Space Center (KSC). Personnel at KSC began working longer hours in 1973, getting all systems ready for the long anticipated May launch date. Inclement weather threatened to disrupt the schedule, but by May 14, 1973, conditions had improved sufficiently to warrant initiation of the countdown sequence. At 1:30 p.m. the 334-foot Saturn V carrying Skylab lifted off from its launch pad, ending the years of planning and preparation. Now the question became whether the program could deliver on the promises its proponents had made for it. 27. Newkirk, Ertel, with Brooks, Skylab, p. 279. 28. Compton and Benson, Living and Working in Space, pp. 218-30. Telemetry received at the Johnson Space Center (JSC) indicated that the powerful Saturn V had taken only ten minutes to place its cargo into orbit at a height of 270 statute miles. At that point various electrical systems aboard Skylab began to come to life .29 At first every indication suggested a normal process, but soon Flight Director Donald Puddy noticed readings that gave him pause for concern. After a few hours of investigation, NASA officials determined that two things had indeed gone wrong with the mission. First, the two solar panels, which would provide power for the laboratory, had failed to deploy properly. And second, it appeared that a shield designed to both protect against micrometeorites and provide shade for Skylab had been lost. Both of these developments posed serious, perhaps even mission-threatening, challenges for NASA officials to ponder. NASA officials also hoped that the astronauts could salvage some power capacity from the solar panels. Data received from Skylab indicated that one of the panels had remained attached to the laboratory, but had not deployed. If debris from the micrometeorite shield had trapped it, Conrad, Kerwin, and Weitz might have a chance to free the panel. To facilitate these repair efforts, the agency requisitioned specific tools from the A.B. Chance Company and included them in the cargo which the astronauts would take into outer space. 29. After the death of Lyndon Johnson in January 1973, the Senate passed a resolution in February to rename the Manned Space Center after the individual who had been in many ways "the father of the space program." Henry C. Dethloff, "Suddenly, Tomorrow Came... : A History of the Johnson Space Center" (Washington, DC: NASA SP-4307, 1993), p. 214. 30. Belew, Skylab, pp. 41-57. 31. Interview of Mr. Don Arabian, Manager, Program Operations Office, Johnson Space Center, June 12, 1973, Box 05, Skylab, Folder Skylab Oral History Interviews, NASA Historical Reference Collection. When the crew awakened, Weitz entered Skylab to determine if the high temperatures had generated toxic fumes. Finding no such danger, the crew then entered the laboratory and prepared to deploy the parasol they had brought along. Working carefully, they managed to unfurl the device, and noticed an immediate cooling inside the laboratory. The temperature inside Skylab would soon stabilize at ninety degrees. The parasol did not cover as wide a surface area as originally hoped, but it would allow the crew to begin the schedule of experiments in relative comfort. Conrad, Kerwin, and Weitz would waste no time in initiating these efforts. The crew soon established a regular schedule which involved carrying out experiments, exercising, eating, maintaining the vessel, and sleeping. They found no difficulty in adjusting to the sensation of living in outer space, experiencing no motion sickness, but found the pace of the tasks assigned to them very demanding. Within days Conrad suggested revising the time allotments for experiments and other duties, and his crew soon settled into a comfortable routine.33 But the crew soon recognized that insufficient power levels might not allow the completion of a number of the proposed experiments. NASA officials concluded that the astronauts would have to make another attempt to free the remaining solar panel. NASA officials had prepared Conrad, Kerwin, and Weitz for their extra-vehicular repair effort by having them train in a zero-gravity neutral buoyancy simulator. Kerwin, however, had not found the technique practiced on Earth any help to him in his first repair attempt. Therefore, NASA officials assigned a group headed by Russell "Rusty" Schweickart (the commander of the back-up crew for the first mission) to devise another method for deploying the solar panel. The team finally recommended using a twenty-five foot long cable cutter to free the panel and a tether to maneuver it, once freed, into proper alignment. Ground control relayed instructions on the procedure to the crew, and on June 7 Kerwin and Conrad left the workshop to make another attempt. 32. Belew, Skylab, pp. 61-63. 33.Compton and Benson, Living and Working in Space, pp. 286-94. Skylab Ultra-violet Stellar Astronomy-A special airlock in the wall of the Workshop allowed the crew to Perform several "outside" experiments. Here, a camera equipped with calcium fluoride transmission optics to pass ultra-violet light is aimed at stars in the Milky Way field. (NASA photo no. 72-H-891). At that moment, however, Kerwin had an idea. He took the line connecting him to the antenna and shortened the length until he had secured his position. Having thus gained leverage, within ten minutes Kerwin proved able to cut the strap. The solar array panel then swung open at an angle of about twenty degrees. At that point, Kerwin and Conrad began to pull on the tether connected to the device, but with no success. Finally Conrad stood up and slung the tether over his shoulder, while Kerwin continued to pull. This technique worked almost too well-the recalcitrant hinge broke loose suddenly, sending the astronauts flying off into space. When the restraining cords stopped their motion, Kerwin and Conrad saw the panel almost fully deployed. Within days the astronauts could report that power levels had almost doubled. Having lost a significant portion of the four week duration of the mission to repair efforts, NASA officials hoped to salvage as much of the experimental schedule as possible. Forced to prioritize the investigations, they decided to give the highest ranking to medical experiments. During the time remaining in orbit, Conrad, Kerwin, and Weitz managed to achieve nearly 100 percent of the projected goals that medical officials had set forth for the mission.35 Of particular interest to the medical community was the fact that weightlessness allowed the skeletal structure of the astronauts to fully extend, increasing their height by an inch. It also balanced fluids within the body more evenly, thus making the faces of Conrad, Kerwin, and Weitz appear fuller. With a regular regimen of exercise the astronauts remained in outstanding physical condition throughout the duration of the mission, proving the adaptability of humans to living in outer space. The crew also managed to accomplish a high percentage of the assigned tasks involving the observation of solar activity, eventually taking over 25,000 pictures of the sun. This endeavor proved a highly challenging one for the crew, given the complicated nature of the control equipment. Located in the docking adapter, these instruments activated the ATM telescopes. Kerwin later asserted that the pace of mission experiments kept him from ever completely mastering the control system.36 He found the procedure for observing solar flares especially frustrating. NASA technicians had developed a sensor which would alert the crew to solar flare activity, but the radiation field over the eastern section of South America would frequently trigger the alarm system. After many false warnings, the crew despaired of ever observing a solar flare. But after deciding to spend the entire work day of June 15 in hopes of witnessing such an occurrence, their patience paid off. Weitz proved able to record a flare of impressive magnitude for over two minutes. Although the crew may have felt that their work involving the observation of solar activity had not met up to expectations, astronomers proved genuinely pleased with the results, which they considered to have met eighty percent of pre-mission expectations. 34. Belew, Skylab, pp. 50-75; Compton and Benson, Living and Working in Space, pp. 268-76. 35. Compton and Benson, Living and Working in Space, p. 289. The Sun's hot outer atmosphere, or corona, color-coded to distinguish levels of brightness, reaches outward for millions of miles. A coronagraph, one of Skylab's eight telescopes, masked the Sun's disk, creating artificial eclipses. 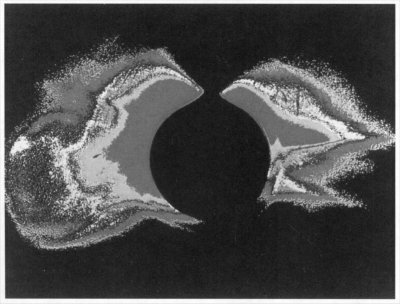 It permitted 8-1/2 months of corona observation, compared to less than eighty hours from all natural eclipses since use of photogrophy began in 1839. (NASA photo no. 74-H-97). 37. Newkirk, Ertel, with Brooks, Skylab, p. 312. 38. Belew, Skylab, p. 89. 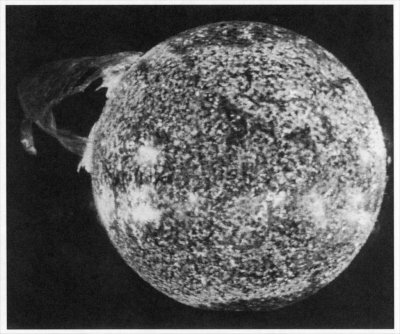 This photo of the Sun, taken from Skylab on December 19, 1973, shows one of the most spectacular solar flares ever recorded, spanning more than 588, 000 kilometers (367, 000 miles) across the solar surface. The flare gave the distinctive impression of a twisted sheet of gas in the process of unwinding itself. The solar poles are distinguished by a relative absence of supergranulation network, and a much darker tone than the central portions of the disk. Several active regions are seen on the eastern side of the disk. This photo was taken in the light of ionized helium by the extreme ultraviolet spectroheliograph instrument of the U.S. Naval Research Laboratory. (NASA photo no. 74-N-434). United States. Encouraged by the success of the first mission, but concerned that further mechanical difficulties occurring with no crew aboard to rectify them might jeopardize the status of Skylab, NASA officials decided to advance the launch date of the second mission by three weeks. Attention would therefore turn again to KSC. This return to good health came just in time. In addition to assigned tasks involved in making Skylab operational, the crew also had the responsibility of deploying another sunscreen over the laboratory. NASA officials had chosen the parasol concept for the first crew to use because of the speed with which the astronauts could deploy it, but had recognized that ultraviolet rays would soon cause the fabric of that device to deteriorate. They therefore decided to have the second crew deploy another device considered for use by NASA during the original mission: the twin boom frame sunscreen. Bean, Lousma, and Garriott had practiced extensively on the necessary construction techniques in the neutral buoyancy tank at Houston, and with their health vastly improved they felt ready to begin the task on August 6. After completing the necessary repair, the crew resumed the regular experimental schedule. As with the first mission, the observation of solar phenomena had received a high priority. From August 10-20 in particular, the astronauts devoted a significant portion of their work days to capturing solar activity on film. On August 21 the crew witnessed a gigantic bubble develop on one side of the Sun and watched it grow to a size nearly three-quarters that of the Sun itself. In all, the second crew would spend over 300 hours engaged in solar-related activity; their efforts received unqualified praise from the scientific community, and many had an opportunity to speak to the crew directly from Houston. 40. Compton and Benson, Living and Working in Space, pp. 300-02. NASA officials had been troubled by readings indicating that leaks might have occurred in the rocket thruster systems, thus jeopardizing the mission. Lousma and Garriott confirmed during their space walk that the situation had stabilized. The endeavors of Arabella and Anita certainly certainly caught the fancy of the people on Earth, but the astronauts themselves proved able to capture their attention as well. Lousma provided amusing commentary about the mission on the twenty-four-hour-delay communication channel B, and Garriott conducted a number of experiments which gave vivid televised visual illustrations of scientific principles. But the crew's most famous exploit involved a mysterious voice. One day the ground control team at JSC heard a female voice speaking to them from Skylab over the public air-to-ground channel. Houston hesitantly responded, and the conversation with the unidentified person went on for a few minutes. Finally, Garriott aboard Skylab burst out in laughter; he had brought along a tape recording of his wife's voice for this bit of levity. On September 25, 1973, after fifty-nine days in space, the crew boarded the command module and began their return to Earth. At 6:20 p.m. EDT, the capsule splashed down in the Pacific Ocean 300 miles from San Diego. Picked up by the U.S. S. New Orleans, less than forty-five minutes later, the astronauts received accolades for their impressive accomplishments. Encouraged by their efforts, NASA officials eagerly began final preparations for the third, and last, Skylab mission. NASA officials had hoped to launch the third crew, consisting of Marine Lieutenant Colonel Gerald Carr, Air Force Lieutenant Colonel William Pogue, and civilian Edward Gibson, on November 11, 1973. Flaws in the launch vehicle temporarily postponed the mission, but on November 16 the Saturn IV blasted off, taking the crew to a rendezvous with Skylab. After initial difficulties, Carr managed to dock the two crafts. Under orders from NASA, the crew would wait until after a rest period to begin the activation of the laboratory. To minimize the chances of having the crew suffer from space sickness, NASA medical personnel had ordered the astronauts to take anti-nausea pills. Unfortunately, this precaution did not help Pogue, who soon became quite ill. Gibson and Carr pondered what to do about this incident; if they reported the full extent of Pogue's distress (which included vomiting), NASA officials might alter the schedule of the mission. They chose, therefore, to reveal to Houston only that Pogue had experienced some nausea, but would withhold any mention of the vomiting. 42. Newkirk, Ertel, with Brooks, Skylab, p. 334. 43. Belew, Skylab, pp. 114-15. 44.Newkirk, Ertel, with Brooks, Skylab, pp. 333-35. Matters came to a head on December 30. The crew initiated a frank discussion with capsule communicator Richard Truly, hoping to make NASA officials aware of their objections to the pace of activities set forth for them. Carr proved especially critical of the fact that NASA mission plans had allocated virtually no free time for the astronauts directly before and after the sleep periods. Truly attempted to mollify the astronauts by praising their efforts to date, but subtly suggested that NASA felt that the crew could work at a faster pace during the last half of the mission. After almost an hour of discussion (punctuated by a 20-minute break in the communications link) Truly ended the conversation by telling the crew that he was "very happy with the way you're doing business." Both sides seemed satisfied that they had clarified their respective points of view, and in the days to follow, ground control noted a new sense of responsiveness on the part of the astronauts. This incident illustrates an inherent tension that ran through much of the history of the space program. Beginning with the confrontation between the original seven astronauts and the designers of the Mercury capsule over the inclusion of a window in the spacecraft, astronauts had repeatedly disagreed with positions taken by the scientific and engineering community regarding the subject of space flight. To the crew of the third mission, it seemed as though flight planners felt that every mission could be treated like a computer ready to be programmed. Pogue, Gibson, and Carr had asserted the astronauts' view that flexibility had to be built into a flight plan to provide for the diversity of each human put into outer space. In the wake of their conversation with Truly, the astronauts felt that they had regained their individuality. Pleased with their new freedom, the astronauts threw themselves back into their work. Gibson in particular demonstrated almost a compulsion to record a solar flare in its entirety, spending extra time manning the solar observation controls. His diligence was rewarded on January 21, 1974, when he witnessed an impressive solar event.47 Coupled with the observations already done on the comet Kahoutek, the third crew could therefore take great pride in their contributions to the field of astronomy. 46. Ibid, pp. 316-24; Belew, Skylab, pp. 128-30. 47. Compton and Benson, Living and Working in Space, pp. 331-33.
eventual moment of deactivation. They experienced some difficulty in storing in the command module all the things they wanted to take back to Earth, but using ingenuity and a certain amount of force they succeeded in packing their craft. On February 8 the crew boarded the command module, but before disengaging from Skylab they used the thrusters of the Apollo spacecraft to lift the laboratory to a higher orbit. After accomplishing that task, Pogue, Carr, and Gibson headed for earth. One final bit of adventure awaited this crew. When Carr attempted to maneuver the command module prior to reentry, he found that neither the pitch nor the yaw controllers worked. Momentarily nonplussed, he nevertheless quickly shifted to another system and resumed the landing sequence. Later, the astronauts revealed they had accidentally activated a set of circuit breakers, thus neutralizing the thrusters in question. Carr's rapid response had saved the day. As on the second mission, the Navy used the U.S. S. New Orleans to conduct the recovery operation for the final crew, thus bringing to an end the 171 days, 13 hours, and 12 minutes of space flight connected with the Skylab program. Goldberg's observation provides a fitting epitaph for Skylab (which would disintegrate upon reentering the Earth's atmosphere in 1979). While the program unquestionably yielded valuable scientific information, its greatest value came from its demonstration of the importance of the human element in the space program. As John Disher, NASA Director of Advanced Programs in the Office of Space Transportation Systems, would later note, Skylab "turned around many people who thought men in space were a hindrance rather than a help. "50 Echoing this sentiment, Program Director William Schneider stated that Skylab had shown that, regarding the space program, "the limit is only our resolve, not the ability of men to work, and not our technical knowledge." 48. Compton and Benson, Living and Working in Space, p. 340. 50. John H. Disher, "Space Transportation: Reflections and Projections," in Durant, ed., Between Sputnik and the Shuttle, p. 213. 51. Stuhlinger and Ordway, Wernher von Braun, pp. 298-99. 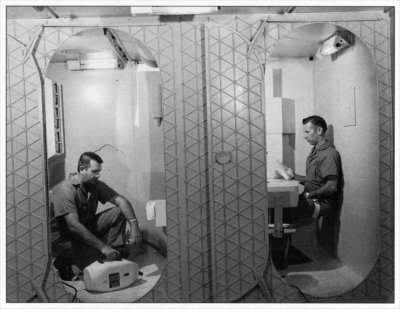 Ralph Geiger (left) and Ralph Murphy check out equipment in the waste management and food management compartments, respectively, in a full-scale mockup of Skylab at the NASA Marshall Spare Flight Center. The Workshop was developed by Marshall Center for three Earth orbit missions in 1972, the first lasting 28 days and the other two 56 days each. This view of the living area shows the "telephone booth" type doors used and the grid floor that separates the living area from the laboratory or working area making up the 10, 000 cubic feet of space inside. joined to the Workshop main body to form the "cluster' configuration was an airlock, multiple docking adapter Apollo Telescope Mount and the Apollo command/service module, All of the components were to be launched by a Saturn V with the exception of the command/service module, into an Earth orbit of about 250 statute miles. Several days later NASA Planned for the astronauts in the command/service module to be launched by a Saturn 1B rocket for rendezvous and docking with the multiple docking adapter. The cluster of spacecraft was used to conduct experiments, scientific and medical, and for Photographic studies of the Sun. (NASA photo no. 69-H-1645). focused planning efforts in this direction.52 The Skylab program, therefore, provided crucial and timely evidence to support the predominant NASA position. Fittingly, the Collier Trophy Committee decided to present the 1973 trophy of their organization to the director of the Skylab program. Although the Committee noted the contributions of the over 26,000 individuals who had worked on the program, the members felt that William Schneider should receive the trophy on behalf of the three crews because of his leadership in the extraordinarily difficult venture. When Vice President Gerald Ford presented the award to Schneider on June 4, 1974, it provided an apt climax to an American space project which had proved without question the value of "the human touch" in space endeavors. 52. Howard E. McCurdy, The Space Station Decision: Incremental Politics and Technological Choice (Baltimore, MD: Johns Hopkins University Press, 1990), p. 8.